Hi, let me take this opportunity to introduce myself and provide you with some information about my professional background. My name is Talal and I graduated in General dentistry from Safarik University in Slovakia in 2002. I started my career as a dentist working at the Louis Pasteur Faculty Hospital where I gained extensive experience in restorative and aesthetic dentistry. My interest in oral surgery and associated academic work grew whilst working with eminent dentists and oral surgeons at the faculty teaching hospital. I completed my PhD degree in Precancerous Diseases in Oral Cavity in 2010. I continue to keep my knowledge and skills up to date by working alongside highly experienced and skilful professionals and attending courses and workshops to familiarise myself with latest procedures and techniques in dentistry and aesthetic procedures. 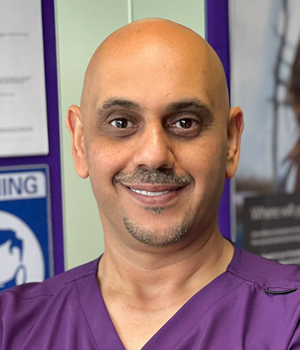 I have huge experience in treating children and over the years, I have learnt techniques, communication skills and creating relaxed comfortable environment to put younger children and anxious patients at ease whilst undergoing dental assessments and procedures. I would encourage you to freely ask for advice on aesthetic procedures. Beside routine aesthetic procedures, I offer Hollywood smile, white filling, non surgical anti-wrinkle injections (Wrinkle treatment ®) and dermal fillers. It is my goal and vision to provide you with a confident smile. Please feel free to discuss your concerns and we could have a discussion regarding your concerns and available treatment options in a relaxed and comfortable environment. Looking forward to see you soon.